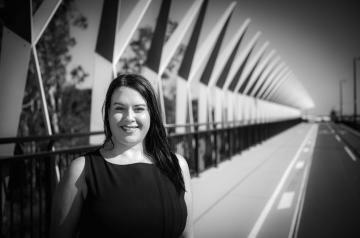 Emily Gaunson comes to Aura Property Sunshine Coast with a wealth of knowledge and practical experience in all aspects of Property Management. With over 10 years experience she has seen it all, from big city agencies to small regional offices. There isn't much she hasn't handled over the years. Property Management has always been Emily's passion and she believes communication is the key element to the success of managing your investment property. Emily will go the extra mile each and every time, ensuing nothing but 100% service to you and your tenant. Emily always sets the standard high for loyalty, transparency and best practice. She regularly attends professional and personal development programs to further her already broad knowledge an keep up to date with legislation changes. If you ever have any questions, Emily is certainly your go to person and you can sleep easy with her looking after your largest investment. Located in ‘Aura, the City of Colour’ is this brand new home featuring dishwasher, ceiling fans throughout, entertaining area, fully fenced grassed back yard and includes garden maintenance!! Featuring:- * 3 bedrooms (all with built-ins) * Ensuite to main bedroom. * Spacious living/dining area. * Well spaced kitchen with dishwasher and stainless steel appliances. * Ceiling fans throughout. * Flyscreens on all windows and doors. * Covered entertaining area. * Study nook. This modern home is perfectly located in a quiet street in the Aura estate. Just walking distance to the Pedal Park, Baringa State Primary School, Skate Park & Georgie's Cafe. Featuring some great extras such as 5 burner gas stove top, walk in pantry, 2 living areas and seperate laundry, this is one you must view. Features:- * 3 bedrooms (all with built-in wardrobes) * Ensuite. * 2 seperate tiled living areas. * Modern kitchen with 5 burner gas stove top. * Walk in pantry & dishwasher. DUCTED AIR-CONDITIONING & LARGE BACK YARD IN AURA!! Rarely do you find a property in a new estate that features both DUCTED air-conditioning throughout and large back yard!! Walking distance to the local Aura park and new Baringa State Primary School, you better get in quick. Featuring:- * 4 bedrooms. * Built-in wardrobes with shelves. * Walk in robe & en-suite to master bedroom. * Tiled lounge/dining area. * Carpeted media room. * Kitchen with lots of cupboard space. * Seperate study area. * Ceiling fans throughout. * Security screens. If you’ve been looking for a house with all the extras to call home, then this is it! This beautiful ex-display home is located in a premium street in Caloundra West and comes with all the bells and whistles. Features:- * 4 bedrooms. * Built-in wardrobes. * Ducted air-conditioning. * Modern kitchen with 900mm gas cook top. * Separate media room. * 12 panel solar system with energy monitoring. * Ceiling fans throughout. * Oversized back patio. * Covered entertaining area. This one year old home is a rare fine with 3 living areas, solar panels and approximately 6 metres of side access!! The large windows capture the natural light inside and extra large patio area that provides great space to enjoy entertaining. Features:- * 4 bedrooms (all with built-ins) * Large walk in robe to master bedroom. * En-suite. * Separate study/foyer area. * 3 living areas. * Split system air-conditioning x 2. * Modern kitchen with large walk in pantry. * Separate laundry. This brand new terrace home is perfectly located in Aura within walking distance to Baringa State Primary School, Izba Cafe, local parks and the new shops that will be constructed at the end of the year. Featuring:- * 3 bedrooms (all with built in wardrobes) * Ensuite to master bedroom. * Tiled open plan living/dining. * Air-conditioning. * Ceiling fans throughout. * Spacious kitchen with dishwasher. * Private court yard with fake grass. * Small pets considered upon application. This brand new home in Aura features 2 separate living areas, air-conditioning in both the master bedroom and living area as well as separate laundry and large kitchen with heaps of cupboard space. Perfectly located in a quiet street and within walking distance to the Pedal Park and Baringa State Primary School. Features:- * 3 bedrooms (all with built-ins) * Air-conditioning and ensuite to master bedroom. * Spacious kitchen with dishwasher. * Tiled living with raked high ceiling. This beautiful terrace home flows seamlessly into the spacious open plan kitchen, living and dining areas. Unlike many homes of this style, this property has a private courtyard garden with a roof covered patio and garden shed for additional storage. Features:- * 3 bedrooms (all with built-in wardrobes) * Ensuite with double shower head. * Spacious kitchen with extra bench space. * Air-conditioning to master bedroom & living area. * Ceiling fans throughout. * Undercover patio with ceiling fan. 2 LIVING AREAS, SECURITY SCREENS & WALK TO PEDAL PARK!! This 3 bedroom home is spacious and well laid out. With 2 living areas, walk in pantry, air-conditioning and security screens throughout, this will be the one to pick! Features:- * 3 bedrooms (all with built-ins) * Ensuite with his & her sinks. * Walk in wardrobe to master. * Large tiled living area. * Separate carpeted lounge. * Kitchen with large walk in pantry. * Security screens throughout. * Ceiling fans. * 2 x split system air-conditioners. * Separate laundry. * Double lock up garage.